A tiny island within an area a little larger than five square kilometers and less than half an hour away by boat from Mykonos. It's often called "the sacred island" and "the island of light" because, in Greek mythology, it was the birthplace of Apollo, the god of light, and Artemis, the goddess of night light. According to the testimony of Thucydides, the first people to inhabit the island of Delos were the Kares and the Phoenicians. By the end of the 5th century B.C. there were already a few houses and farmhouses round the sanctuary, but the city was developed within only a few decades after 166 B.C. It is estimated that round 90 B.C. this tiny little island, which is but a dot on the Mediterranean map, was already inhabited by roughly 30.000 people from every part of the world. All these different people co –existed peacefully, having adopted the Greek way of living, speaking and writing in Greek, living in Greek houses and building sanctuaries dedicated to their gods without having any particular problem. The all worked and enjoyed themselves along with the local people, while their children attended the same high school, played and worked out in the same arenas. For the first time then in the human history, on this tiny corner of the earth, all people in the Mediterranean seem to be co – existing peacefully. The city went into decline after it was looted and razed in two separate attacks; residents gradually left the island, and eventually Delos was abandoned completely and almost forgotten. Delos regained international attention when archaeologists began excavating its ruins in 1872. In 1990, Delos was added to the UNESCO World Heritage List. A description for UNESCO's Delos listing says "The archaeological site is exceptionally extensive and rich and conveys the image of a great cosmopolitan Mediterranean port." Small numbers of travelers, mainly from Europe, started visiting the island to view the fascinating historic sites that were gradually being unearthed. 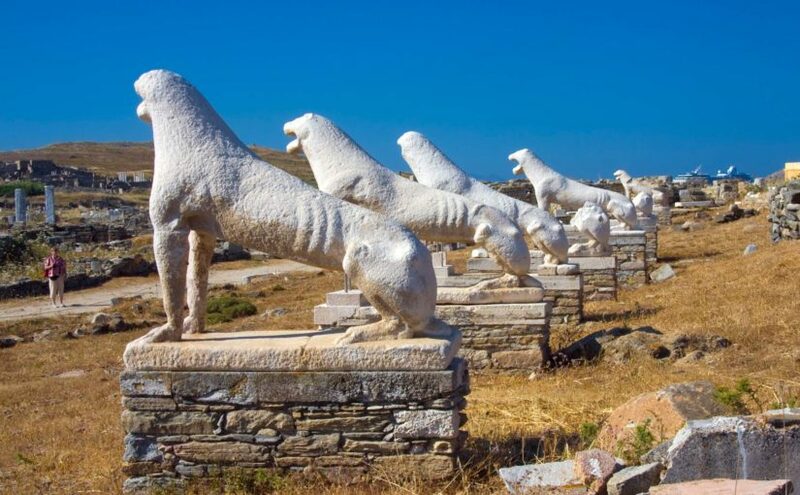 Over the decades, the trickle of tourists turned into a steady stream of sightseers from around the world, and today Delos is a top tourist attraction drawing more than 100,000 visitors each year and is widely considered a "must see" attraction for people visiting Mykonos.